Inspiration is a funny thing sometimes. For me sometimes it has to shift and settle a bit before it comes out in the form of new art. This fish story is one of those instances. Months ago my husband and I were walking around Guerneville, a little rundown Russian river resort town, and came upon these wonderful koi fish spray painted on the sidewalk in small swimming groupings. We saw about four or five schools of fish spread out in different parts of town, the one pictured here is on the main drag in front of a restaurant. I was very taken with this bit of artful graffiti and immediately took out my cell phone to take a picture. I have to say the best thing about the camera phone revolution; you can always capture inspiration wherever you find it. The photos languished in my phone for a while until I synched my phone and computer up and these little sidewalk muses reminded me of their charm. So I got to work making my own stencil. I’ll tell you I have used this stencil in a number of ways and will share more koi with you as they evolve but today I want to share the quilt I finished a couple of weeks ago at The Bishop’s Ranch quilt retreat. 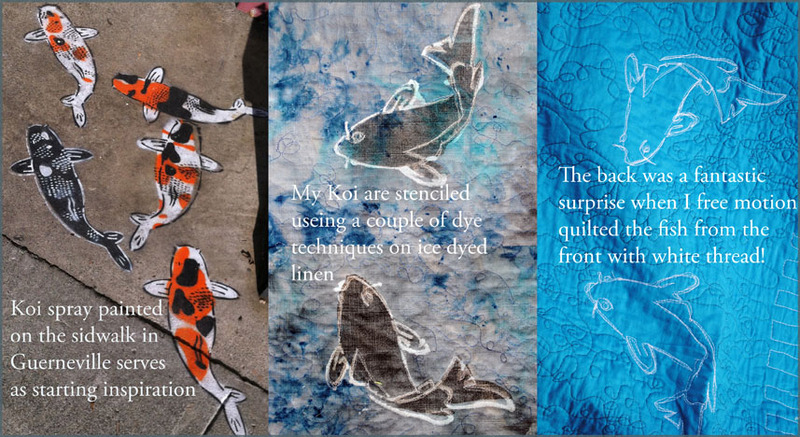 The fish inspiration merged with an urge to do some experimenting with fabric dying. I had been reading about ice dyeing and wanted to try it. The basic idea is you crinkle up your fabric and shove it into a dishpan or tray. Then you cover the whole thing with crushed ice and sprinkle powdered dye over the ice…. And that is it! The ice melts and the dye spreads and makes fantastic organic beautiful results. That’s how I created the background fabric. Then using my fish stencil I stenciled on this relatively new product called color magnet and dyed the whole thing a light grey. Where the fish were stenciled the color magnet grabbed the dye and made them a wonderful charcoal color. I then stenciled the fish outline with a color removal paste that basically bleached out the fish outlines. I love how this all turned out and decided to make a quilt with the fabric during the quilt retreat. 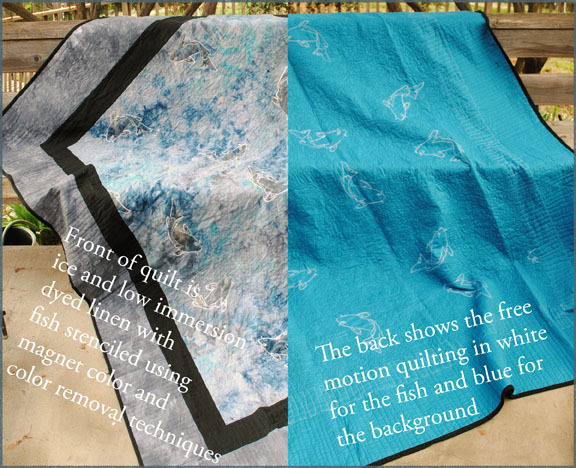 I free motion quilted in a swirly pattern using variegated blue thread, then outlined the fish in loose sketching lines in white. I had now idea how amazing the back with the white on the bright blue would look. I know I’m going to do more of this thread drawing on plain fabric in the future. So one inspiration leads to the next and the next in a meandering path. So lunch in a sleepy town leads to a wonderful quilt and who know what else. So keep you camera phone close and like a scout always be prepared to be inspired!